This is my view at the moment in my house because it’s minus 7 degrees F outside with a wind chill factor that is anticipated to reach the double digits. 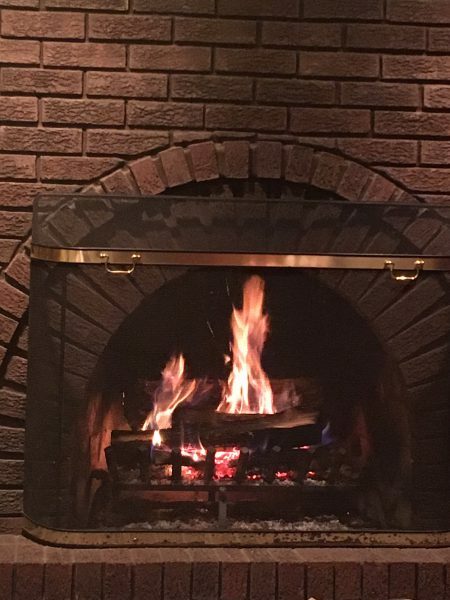 My husband Bill and I decided to stay in and snuggle in front of this cozy fire. 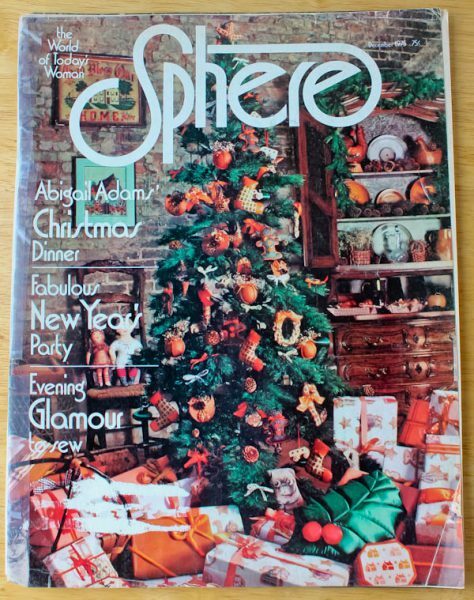 It’s less than an hour before 2018 and I just realized I have not posted my monthly Sphere blog! Guess I had better hurry. Since I only have a few minutes before December ends, I will not have time to make a recipe for this issue, but will include one for a New Year’s Eve beverage to toast in the New Year. For my Sphere enthusiast readers (and I know there are many!) who love to hear what is in each issue of our favorite vintage magazine, this one begins with an 18th century Christmas menu from Abigail Adams. It features winter squash soup, roast turkey, ham, crab, yams with chestnuts, cranberries, and squash rolls. There is an article on food gifts with one recipe I wish I would have tried. It’s a candy called “Whiskey Nut Balls” that apparently are so good, Sphere declares that if you just turn your head, they will disappear. Another article offers a full menu for a New Year’s Eve buffet with crab strudel, mushroom puffs, shrimp en brochette, steak tartare and white radish sandwiches, brie with grapes, and mincemeat tarts. Each issue of Sphere features wine suggestions and recipes from Paul Kovi of The Four Seasons hotels. This month he had suggestions for punches. The one below he called “an unusual recipe” that was prepared to be served with braised red snapper and it received rave reviews. Measure all ingredients except cream into blender container. Cover and blend on medium speed for about 4 minutes. Add cream to container; cover and blend on medium for another 5 seconds. Strain; then refrigerate until cold. Pour into chilled punch cups. Serves 6, about ¾ cup each. Happy New Year! Looking forward to swapping grandma photos and stories with you. Try it and see if it works! I’d love to hear. And a Happy New Year to you too! Thank you for sharing this latest recipe! It sounds interesting and unusual! Stay warm & cozy. Bountiful blessings to you & the family in the New Year.